Among the increasing number of countries filtering the Internet, China has stood out in its efforts to articulate a doctrine to validate this practice. In aWhite Paper released in June 2010, for example, Chinese authorities indicated "state security and social harmony" among the pillars of Internet development, and while recognizing the significance of freedom of expression, the paper stressed that when "exercising such freedom and rights, citizens are not allowed to infringe upon state, social and collective interests." The claim that "the Internet of various countries belongs to different sovereignties" stands in sharp contrast with the U.S.'s pledge "for a single Internet where all of humanity has equal access to knowledge and ideas," expressed only a few months earlier by Secretary of State Hillary Clinton. While it is evident how China has been developing a distinctive domestic approach to the Internet and the role of media in society more generally, whether and how the ideas informing this approach are spreading is far less clear. The few analyses provided to date have been affected by the presumption that as Western powers have been actively trying to export uses of the media supporting democratization processes in Africa, China should similarly be trying to export its version of authoritarianism abroad. But there is little empirical evidence showing this to be the case. A recent op-ed in The New York Times rightly pointed out that in autocratic Ethiopia, where China's EXIM bank provided a $1.5 billion loan to overhaul the country's telecommunication system, free media are struggling. Opposition blogs are blocked and the prime minister argued that Ethiopia has a right to jam the international broadcaster Voice of America because of its "destabilizing propaganda." China has been accused of providing the technology and expertise to make these forms of censorship possible. A few years earlier, however, it was the expertise provided by Cisco Systems and Hughes Networks, two companies based in the U.S., that allowed the Ethiopian government to develop WoredaNet, one of Africa's most ambitious and problematic e-government projects.WoredaNet, which stands for "Network of district administrations," employs the same protocol the Internet is based on, as well as satellite communications, to allow ministers, civil servants, and trainers in the capital to videoconference with the regional and district administrations and instruct local officials on what they should be doing and how. As an indication of the sensitivity of the project, the servers necessary to manage videoconferencing are installed in the office of the prime minister. On the one hand, WoredaNet has increased the presence of the state on the ground, as a political entity, but also as a service provider. On the other hand, in a country such as Ethiopia, where the distinction between the party and the state is increasingly blurry, WoredaNet has been also used to mobilize support in critical moments, such as before an election. But if we turn to West Africa and we consider, for example, Chinese investments in the media and telecommunication sector in Ghana, a country with some of the "freest media" on the continent, a very different picture emerges. China has recently provided $180 million to help the Ghanaian government's efforts to use new communication technologies to increase the efficiency of the state apparatus, and regularly offers scholarships to Ghanaian journalists who are willing to continue their studies in China. This is part of a broader scheme of agreements that are turning Ghana, where large oil reserves have recently been discovered, into the recipient of one of the most generousassistance packages ever offered by China to an African country. However, according to research we have been conducting at the University of Oxford and that will be published later this year, the increasing role of China appears to have had no effects on Ghana's media system, as China's approach to the media seems to have little appeal for Ghanaian policy makers and media professionals. As a journalist working for the Daily Graphic, Ghana's leading newspaper, pointed out: "People in Ghana do not care too much about which political model China is proposing. It is the people in the West who care more about a rising China." China's presence in the media sector in Africa is still very recent and it has been characterized by trial and error. Much can change in the coming years, but these examples point to some important trends. First, while significant attention has been focused on China's role in providing tools to autocratic regimes to control citizens and filter content, it is companies based in the West that still dominate this market. Software produced in North America continues to be the cyber-weapon of choice for many authoritarian regimes trying to censor the Internet, and it is a program produced in Dublin, not in Beijing, that has been recently used by the Syrian government to disrupt SMS used by demonstrators to mobilize. The demand from authoritarian regimes for tools to control and censor has been high for a long time and Chinese companies simply entered an already crowded market. While it may be easier to criticize the government in Beijing because of the greater control it tends to exercise over Chinese high-tech companies, from the perspective of African citizens it makes little difference whether it is because of the hypocrisy of Western capitalism or China's readiness to provide what it is asked for by its African partners that their voices are silenced. Second, looking beyond Africa's autocratic regimes to other African countries where China has supported the media and telecommunication sectors, there appears to be little evidence that China is attempting to export its model abroad or is changing the balance against freedom of expression. In countries that are committed to use new communication technologies to support a participatory and inclusive development process, China's lack of conditionality in providing aid can arguably offer local actors more resources and room to experiment while combining ideas and technologies from different contexts. China is certainly having an important role in Africa's media space, but to date the debate has been affected by too many prejudices and assumptions about China's intentions rather than concentrating on how China is either helping or hindering African countries to achieve their social and development goals. A less ideologically charged debate would help identifying more compatibilities and complementaries where many see threats. We are no longer in a Cold War situation where African countries must choose sides and a variety of partnerships are becoming possible. Democracy sits firmly upon principles of freedom, justice, social inclusion and participation in civil society. Where these qualities of fairness are absent so too is democracy, for the word is not the thing, to speak of democratic values is easy enough, to dismantle repressive methods and State practices that deny there expression is quite another. President Meles Zenawi Asres of Ethiopia knows little of democracy, human rights or the manifestation of democratic principles and much of repression and intimidation. The EPRDF government rules Ethiopia with a heavy hand of control, restricting completely free assemble – a universal right written into the Universal Declaration of Human Rights (UDHR), inhibiting the freedom of the media and denying the people of Ethiopia freedom of expression in manifold ways. Media freedom is a basic pillar of any democratic society. Freedom of political expression, freedom of speech, and freedom of the press are essential elements of a democracy. Whilst media independence throughout the world is contentious at best, autonomy from direct State ownership and influence is a crucial element in establishing an independent media. The Ethiopian State owns and strictly controls the primary media of television and radio. Not only is there no independent TV and radio in Ethiopia, but access to information is also tightly controlled, as Human Rights Watch (HRW) makes clear in its report, One Hundred Ways of Putting Pressure. Violations of Freedom of Expression and Association in Ethiopia, “the independent media has struggled to establish itself in the face of constant government hostility and an inability to access information from government officials.” Since the 2005 elections in Ethiopia the government has systematically introduced tighter and tighter methods of control, HRW continues, over the past five years the Ethiopian government has restricted political space for the opposition, stifled independent civil society, and intensified control of the media. Since the end of the civil war in 1991 privately owned newspapers and magazines have been appearing and despite heavy regulation by the Meles government, this area of Ethiopian media is expanding. This the government reluctantly tolerates, knowing that print media is of little significance, due to low literacy of the adult population (48%), a shameful figure that the EPRDF is no doubt delighted with, high levels of poverty and poor infrastructure making distribution difficult, newspapers are not widely circulated or read, consequently the main source of information for the majority of people is the state owned television and radio, which serve as little more than a mouthpiece of propaganda for the resident regime, the EPRDF. Internet media is also restricted, with access to the web the lowest in Africa; Research & Markets found “Ethiopia has the lowest overall teledensity in Africa. The population is approaching 90 million, but there are less than 1 million fixed lines in service, and a little more than 3.3 million mobile subscribers. The number of internet users is dismal – below 500,000 at the end of 2009.” 1 The World Bank puts the figure a little higher at 7.5% of the population. In another demonstration of democratic duplicity, the government of Ethiopia controls all telecommunications. Internet and telephone systems must run through the State owned Ethiopian Telecommunications Corporation. The vast majority of the population – 82.40% in 2010, according to a World Bank report released in 20112, live in rural areas and have no access to the ‘worldwide web’ at all. By maintaining monopoly control of telecommunications the Ethiopian Government is denying the majority of the population access to another key area of mass information. This is an additional infringement of basic democratic principles of diversity and social participation, as Noam Chomsky makes clear “The most effective way to restrict democracy is to transfer decision-making from the public arena to unaccountable institutions: kings and princes, priestly castes, military juntas, party dictatorships, or modern corporations.”3 Party dictatorships fits the Ethiopian government tailor-made, although their arrogance and vanity would no doubt prefer the title of ‘kings and princes’, Emperor Meles perhaps, following in the brutal glow of that other conceited controller Halie Sellassie. The EPRDF regime is in fact a dictatorship and known as such to the majority of Ethiopians living inside and indeed outside the country, who are courageous enough to speak out and make their views known. Courageous indeed, for as with all cowardly brutal states, the EPRDF rules by violence, intimidation and fear, HRW again Ethiopia’s citizens are unable to speak freely, organize political activities, and challenge their government’s policies through peaceful protest, voting, or publishing their views without fear of reprisal. Such is democratic living under the Meles machine. Ethiopia ratified this international treatise on 11th June 1993, and is therefore legally bound by its articles. By imposing tight regulatory controls on media inside and indeed outside of Ethiopia, the case of ESAT TV based in Holland, whose satellite signal is repeatedly [illegally} blocked by the EPRDF, is an important case in question. Not only is the Ethiopian government in violation of international law, but by completely restricting the freedom of the media and inhibiting completely any hint of dissent, the regime is also in contradiction of its own constitution. Article 29, entitled rather optimistically ‘Right of Thought, Opinion and Expression’ states, 1. Everyone has the right to hold opinions without interference. 2. Everyone has the right to freedom of expression without any interference. This right shall include freedom to seek, receive and impart information and ideas of all kinds, regardless of frontiers, either orally, in writing or in print, in the form of art, or through any media of his choice. 3. Freedom of the press and other mass media and freedom of artistic creativity is guaranteed. Freedom of the press shall specifically include the following elements: (a) Prohibition of any form of censorship. (b) Access to information of public interest.4 Clear and noble words, indeed democratic in content and tone, however words that sit filed neatly upon the shelf of neglect and indifference, as the people suffer and cry out to their mother country, serve only as a mask of convenience and deceit allowing the betrayal of the many to continue. Human Rights Watch gently states, the 1995 constitution incorporates a wide range of human rights standards, and government officials frequently voice the state’s commitment to meeting its human rights obligations. But these steps while important, have not ensured that Ethiopia’s citizens are able to enjoy their fundamental rights. In 2009 the EPRDF passed two inhibiting pieces of legislation that embody some of the worst aspects of the governments decent towards greater repression and political intolerance. The controversial CSO law, is according to HRW, one of the most restrictive of its kind, and its provisions will make most independent human rights work impossible. A ‘counterterrorism’ law was introduced at the same time; this second piece of repressive legislation allows the government and security forces to prosecute political protesters and non-violent expressions of dissent as terrorism. Since the introduction of these internationally criticised laws, the UN Jubilee Campaign in its report ‘Human Rights Council Universal Periodic Review Ethiopia’ recommends the adoption of this law [emphasis mine] be repealed,” the umbrella term ‘terrorist’, meaning anyone who disagrees with the party/state line continues to be used and manipulated as justification for all manner of human rights violations and methods of suppression and control – the aim of all dictatorships. What defines a terrorist or an act of terrorism remains vague and ambiguous, enabling the Meles regime to construct definitions that suit them at any given time. Amongst other travesties of justice the legislation, The Bureau of Investigative Journalism reveals, “permits a clamp down on political dissent, including political demonstrations and public criticisms of government policy, it also deprives defendants of the right to be presumed innocent.“5 A primary function of the media in a democratic society is to examine and criticise the government and provide a public platform for debate and participation. This law denies such interaction and freedom of expression. The law is in violation of the ICCPR and blatantly contravenes the much-championed Ethiopian constitution; idealised images of goodness, remaining un-manifest, stillborn. Control flows from fear, the greater the dishonesty, corruption and greed the more extreme the controls become. Under the neglectful corrupt governance of the EPRDF, Ethiopians are subjected to a range of human rights abuses and violations political opposition has been unofficially banned, making this democracy sitting in the Horn of Africa a single party dictatorship. The UN in its human rights report finds, “resistance to opposition has become the primary source of concern regarding the future of human rights in Ethiopia” and confirms the view of HRW, stating “The CSO law directly inhibits rights to association, assembly and free expression.” The Meles regime seek, as all isolated corrupt dictatorships do, to centralize power, deny dissent and freedom of expression and suppress the people by intimidation, violence and fear. Creating an atmosphere of apprehension, extinguishing all hope of justice, true human development and freedom from tyranny. Disempowerment is the aim, the means are well known, crude and unimaginative, keep the people uneducated, deny them access to information, restrict their freedom of association and expression and keep them entrapped. The days of the dictator are over, no amount of repressive legislation can any longer safeguard a regime that rules through violence and inhibition. Meles and his cronies ensconced behind armed walls of duplicity, may well seek control, the fearful always do, the will of the people though is for freedom, justice and peace, enjoy your privilege President Meles, for your days are numbered, the will of the people must and shall be done for justice and the rule of law underlies their every call for liberty and the observation of their human rights. PEN American Center yesterday, 12 April 2012, named Eskinder Nega, journalist and dissident blogger in Ethiopia, as the recipient of its 2012 PEN/Barbara Goldsmith Freedom to Write Award. Nega, an advocate for press freedom and freedom of expression in Ethiopia, was arrested on 14 September 2011, and is currently being tried under the country's sweeping anti-terror legislation, which criminalizes any reporting deemed to "encourage" or "provide moral support" to groups and causes which the government considers to be "terrorist." He could face the death penalty if convicted. The award, which honors international writers who have been persecuted or imprisoned for exercising or defending the right to freedom of expression, will be presented at PEN's Annual Gala on 1 May 2012, at the American Museum of Natural History in New York City. "The Ethiopian writer Eskinder Nega is that bravest and most admirable of writers, one who picked up his pen to write things that he knew would surely put him at grave risk," said Peter Godwin, president of PEN American Center. "Yet he did so nonetheless. And indeed he fell victim to exactly the measures he was highlighting, Ethiopia's draconian 'anti terrorism' laws that criminalize critical commentary. This is at least the seventh time that the government of Meles Zenawi has detained Eskinder Nega in an effort to muzzle him. Yet Nega has continued his spirited pursuit of freedom of expression. Such humbling courage makes Nega a hugely deserving recipient of the PEN/Barbara Goldsmith Freedom to Write Award." says Godwin. Nega had been publishing articles critical of the government since 1993, he then opened his first newspaper,Ethiopis, which was soon shut down by authorities. He was the general manager of Serkalem Publishing House, which published the newspapers Asqual, Satenaw, and Menelik, all of which are now banned in Ethiopia. He has also been a columnist for the monthly magazine Change and for the US-based news forum EthioMedia, which are also banned. 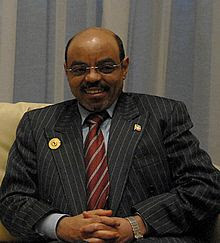 He has been detained at least seven times under prime minister Meles Zenawi, including in 2005, when he and his journalist wife Serkalem Fasil were imprisoned for 17 months on treason charges for their critical reporting on the government's violent crackdown of protests following disputed elections, and briefly in February 2011 for "attempts to incite Egyptian and Tunisian-like protests in Ethiopia" after he published articles on the Arab Spring. Their newspapers have been shut down and Nega has been denied a license to practice journalism since 2005, yet he has continued to publish columns critical of the government's human rights record and calling for an end to political repression and corruption. Nega was again arrested on September 14, 2011, following a column he published questioning the government's claim that a number of journalists it had detained were suspected terrorists, and for criticizing the arrest of well-known Ethiopian actor and government critic Debebe Eshetu on terror charges. Shortly after his arrest, Nega was charged with affiliation with the banned political party Ginbot 7, which the Ethiopian government considers a terrorist organisation. On November 10, Nega was charged and further accused of plotting with and receiving weapons and explosives from neighboring Eritrea to carry out terrorist attacks in Ethiopia. State television portrayed Nega and other political prisoners as "spies for foreign forces." He is currently being held in Maekelawi Prison in Addis Ababa, where detainees are reportedly often ill-treated and tortured. PEN, Human Rights Watch, the Committee to Protect Journalists along with other international organisations have long been concerned about Ethiopia's use of anti-terrorism legislation to justify the jailing of journalists and members of the political opposition. Nega's trial on charges under the 2009 Anti-Terrorism Proclamation, which covers the "planning preparation, conspiracy, incitement, and attempt" of terrorist acts, illustrates this trend. During his trial, which opened on 6 March 2012, the prosecution presented evidence that consisted of nearly inaudible recordings of telephone conversations and other comments and a video of a town hall meeting in which Nega discusses the differences between Arab countries and Ethiopia. Nega took the stand on 28 March and denied all charges against him, saying he has never conspired to overthrow the government through violence and admitting only to reporting on the Arab Spring and speculating on whether a similar movement could take place in Ethiopia. Serkalem Fasil, who was the recipient of the 2007 Courage in Journalism Award from the International Women's Media Foundation, maintained that her husband is "a journalist, not a member of a political party." In announcing the award in New York, Freedom to Write program director, Larry Siems praised Eskinder Nega's "courageous use of the written word to advocate on behalf of his fellow journalists and citizens." "Nega's critiques of the Zenawi government go back two decades, and in recent years he has written fearlessly about the need for peaceful democratic transition and about the fate of other journalists unjustly silenced under the pretense of fighting terrorism," Siems said. "Now as he faces the same fate, in no small part because he spoke out on their behalf, he continues to press for freedom of expression from behind bars. He is truly an extraordinary individual and we are proud to be able to award him this honor." Writer, historian and PEN member, Barbara Goldsmith underwrites the PEN/Barbara Goldsmith Freedom to Write Award. This is the 26th year the award has honored an international literary figure who has been persecuted or imprisoned for exercising or defending the right to freedom of expression. Candidates are nominated by PEN International and any of its 145 constituent PEN centers around the world, and screened by PEN American Center and an Advisory Board comprising experts in the field. The Advisory Board for the PEN/Barbara Goldsmith Freedom to Write Award includes Carroll Bogert, deputy executive director for External Relations at Human Rights Watch; Vartan Gregorian, president of the Carnegie Corporation; Joanne Leedom-Ackerman, international vice president of PEN International and PEN American Center Trustee; Aryeh Neier, former president of the Open Society Foundation; and Joel Simon, executive director of the Committee to Protect Journalists. The Freedom to Write Award is an extension of PEN's year-round advocacy on behalf of the more than 900 writers and journalists who are currently threatened or in prison. 46 women and men have received the award since 1987; 33 of the 37 honorees who were in prison at the time they were honored were subsequently released.